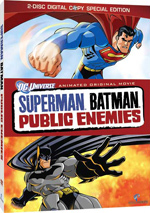 A new entry in a continuing series of direct-to-video animated films with DC Comics superheroes, 2009’s Superman/Batman: Public Enemies takes on an intriguing premise. Faced with severe economic problems and civil unrest, Americans do the unthinkable: they elect Lex Luthor (voiced by Clancy Brown) as president. As one of his first acts, Luthor recruits superheroes to serve the government. Many join willingly, but Superman (Tim Daly) remains suspicious of his old arch-nemesis even when Luthor appears to bring stability back to the US. When a large Kryptonite meteor heads toward the Earth, Luthor uses this as an excuse to claim that Superman is growing more irrational and needs to be captured. Luthor puts a $1 billion bounty on Superman and makes him an enemy of the state. This sets a variety of superheroes and villains on his trail. Superman’s old pal Batman (Kevin Conroy) joins him as they attempt to stay out of Luthor’s clutches and also get to the bottom of the baddie’s plan. On one hand, Enemies feels like a missed opportunity. It comes with a very politically charged concept, as the notion of a fascist such as Luthor coming to political power opens up all sorts of intriguing threads. The film essentially ignores these. It hints at Luthor’s megalomania and the measures he’ll employ to bring order to the nation, but it doesn’t explore these in any particular manner, Enemies comes with a background of how citizens will accept fascism in dark times but it fails to dig into that subject. On the other hand, Enemies provide a pretty terrific action spectacular. While the tale superficially acts as a metaphor, in truth the plot exists for one reason: to pit superhero against superhero. And that’s what it gives us, as we get lots and lots of fine battle sequences. Really, this is nearly a non-stop action piece, and the segments are uniformly good. While not new, it remains delightful to see Supes and Bats work together. They’ve always made a fun team, and Enemies unites them in a very satisfying way. Add to that the continuing parade of new combatants and we get plenty of excitement here. That allows Public Enemies to overcome its storytelling flaws. Yeah, I think it’s a bit of a disappointment that it sets up a provocative theme and then almost totally ignores it, but the movie’s simply too much fun for me to worry about that. 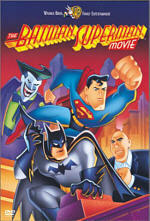 Superman/Batman: Public Enemies appears in an aspect ratio of approximately 1.78:1 on this single-sided, double-layered DVD; the image has been enhanced for 16X9 televisions. While not a stellar transfer, it satisfied. For the most part, sharpness looked good. Some wider shots suffered from moderate softness, but those instances weren’t severe. Instead, most of the film demonstrated positive clarity. Only minor instances of shimmering and jaggies appeared, and I noticed no edge enhancement. Source flaws remained absent. Enemies boasted pretty solid colors. The film used a natural palette that favored primary hues. All of these exhibited good vivacity and life. Blacks were dark and deep, while shadows showed nice clarity. Really, only the occasional bouts of softness detracted from an otherwise fine presentation. I thought the Dolby Digital 5.1 soundtrack of Enemies opened up the comic book material well. This wasn’t a particularly ambitious piece, but it added pizzazz to the program. The forward channels brought out the majority of the material. Music presented strong stereo imaging, while effects cropped up in logical spots and blended well. The surrounds also contributed good information. For the most part, these reinforced the forward channels, but they also contributed a fair amount of unique material. These instances mainly occurred during storms or bigger action scenes. The back speakers brought out a nice sense of space and environment. Audio quality always satisfied. Speech was warm and natural, without edginess or other issues. Music sounded lively and full, while effects displayed good definition. Those elements seemed accurate and dynamic. All of this led to a positive presentation that deserved a “B”. When we head to the set’s extras, we open with five featurettes on DVD One, all of which exist to promote other DC animated projects. Green Lantern: First Flight - The Animated Movie Sneak Peek goes for 10 minutes, 11 seconds and features DC Comics Senior VP/Executive Editor Dan DiDio, producer Bruce Timm, DC Comics Senior VP/Creative Affairs Gregory Noveck, former writer/editor Denny O’Neil, writer Alan Burnett, casting/voice director Andrea Romano, director Lauren Montgomery, and actors Christopher Meloni, Michael Madse, Tricia Helfer and Victor Garber. It looks at the roots of the Green Lantern and delves into aspects of the First Flight film. The program promotes the product well, but it doesn’t do much more than that. Another preview comes with the 10-minute, 44-second From Graphic Novel to Original Animated Movie - Justice League: The New Frontier. 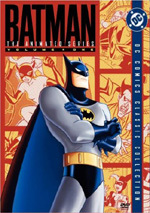 It features Noveck, Timm, Romano, DiDio, Berkowitz, script writer Stan Berkowitz, DC Comics president and publisher Paul Levitz, executive producer Sander Schwartz, writer/artist Darwyn Cooke, DC Comics editorial art director and editor Mark Chiarello, producer Mike Goguen, DC Comics Senior VP/Executive Editor Dan Didio, and director David Bullock. Like the First Flight featurette, this one makes the product look fun. Like the First Flight featurette, this one exists solely to sell DVDs. It may succeed, but it’s still not a exactly stellar DVD extra. Guess what? We find an additional ad via Wonder Woman: The Amazon Princess. it goes for 10 minutes, 25 seconds and includes Levitz, DiDio, Noveck, Timm, Montgomery, writer Michael Jelenic, and actors Keri Russell, Nathan Fillion, Alfred Molina, Rosario Dawson and Virginia Madsen. The show looks at the roots of Wonder Woman and aspects of the movie. It actually has a little more concrete info than its predecessors, but it remains promotional in nature. Batman: Gotham Knight – An Anime Evolution lasts 10 minutes, eight seconds and presents remarks from DiDio, Levitz, Noveck, Timm, Batman writer/editor Denny O’Neil, and writer Josh Olson. This one looks at how Gotham Knight will adapt Batman for the Japanese anime feel. Again, it appears here to sell DVDs, but it proves more introspective than most of its siblings, so it includes some moderately interesting notes. During the eight-minute and 51-second Blackest Night: Inside the DC Comics Event, we hear from DiDio, writers Geoff Johns, Peter Tomasi, Golden Apple Comics GM Ryan Liebowitz, and Golden Apple Comics clerk Mike Phlaumer. Yes, it’s another promo. Like the others, it’s watchable but it doesn’t deliver much more than advertising. A few ads open DVD One. We get clips for Sherlock Holmes, Blu-ray Disc, Halo Legends and Smallville. The Trailers area also includes promos for Green Lantern, Fringe and Batman: Arkham Asylum. Over on DVD Two, we actually find extras – gasp! – related to Enemies. A Test of Minds: Superman and Batman runs 18 minutes, 59 seconds and features Burnett, Noveck, Levitz, DiDio, Public Enemies author Jeph Loeb, Superman on the Couch author Danny Fingeroth, Psychology of Superheroes author Robin S. Rosenberg, and Enemies and Allies author Kevin J. Anderson. “Minds” examines the history of the Supes/Bats partnership as well as the psychology of those characters. This creates an intriguing and interesting exploration of the pair. Dinner with DCU and Special Guest Kevin Conroy lasts 26 minutes, 12 seconds as it shows a chat among Noveck, Timm, Romano and voice actor Conroy. They discuss casting choices and performances, various DC series, and some aspects of Enemies. The participants have all known each other for a long time, so they fit together well. That means we get a nice overview of various areas in a lively, informative program. Here comes another promotional piece! A First Look at Justice League: Crisis on Two Earths goes for 11 minutes, 11 seconds and provides comments from Timm, Noveck, Montgomery, Romano, writer Dwayne McDuffie and actors Billy Baldwin, Mark Harmon, Chris Noth, Gina Torres and James Woods. Like its predecessors, “First Look” gives us an overview of the movie’s story, cast and performances, and other elements as it attempts to entice us to buy it. Yawn. Finally, Bruce Timm’s Top Picks brings us to two episodes of Superman: The Animated Series. We find “The Demon Reborn” (20:54) and “Knight Time” (21:16). Why do we get these particular programs? Because both feature the combined efforts of Superman and Batman – in a way, at least; I won’t spoil the fun of “Knight Time”, but it uses Batman in an unusual manner. The shows fit the DVD’s theme, and they offer good entertainment as well. They’re a nice bonus here. While it lacks the political complexity its theme promises, Superman/Batman: Public Enemies compensates with other strengths. In particular, it throws out so much fine action that it creates a genuinely fun, exciting adventure. The DVD boasts good picture and audio but the extras tend to be lackluster, mainly because so many focus on promotional efforts. Superhero fans will want to give this one a look.